Seemingly simple, yet something that nearly all players find tough, putting well can make a huge difference to your scores. Learn how to putt better with these putting tips and drills. In terms of the stroke itself, putting is probably the simplest component of golf and yet it also is an aspect of the game that most players struggle with. It’s almost comical, isn’t it? Some of the game’s best can crank the ball three hundred yards down the fairway and then end up losing strokes on a three-foot putt. Why? There are a lot of factors. Nerves, lack of technique, lack of practice. For a stroke that consists of no more than twelve inches front and back, there are nearly endless variables that can derail your putting game. Don’t worry, that doesn’t mean that you are beyond hope. Today we will be taking an in-depth look at the art of putting as well as a few very simple ways you can improve your game. I’ll presume that just about everyone reading this at least knows what putting is, but for the readers that don’t I will mention quickly that putting refers to any stroke that you take on the green, using your putter. It is also the most common shot in the game. A decent round of putting will include around thirty-six putts (allowing for two putts per hole) but struggling amateurs are liable to hit much more than that. Since you are going to use your putter on virtually every hole, it’s imperative that you learn to use it well. The first step to good putting actually happens to be a pretty fun one: buying a good putter. The good news is that there is no such thing as a bad putter. Putting is so much a matter of feel that the right club is the one that makes you feel confident as you step up to the ball. The best way to pick out the perfect putter is simply to go to your local golf shop and start playing around with their selection. The club that feels good in your hands and rolls the ball well is going to be the one for you. There are plenty of other aspects to consider as well, of course, such as design, weight, and price but you will know the way in which those factors affect you better than I can. In general, it may be helpful to know that heavier clubs will result in the ball moving faster with smaller strokes than lightweight putters. The way in which the shaft enters the clubhead also affects the way that the club will perform with certain models favoring specific types of strokes. While you will be best off asking a professional help you determine which type is best for your stroke you can, in general, expect pendulum strokes to benefit the most from a center shafted putter, while strokes in which the face of the club opens and closes more might favor a heel shafted putter. Aside from that, the rest is entirely a matter of personal preference. Putters can range in price from $30 – 500 but fortunately, you don’t need to spend a ton of money to end up with a good club. If you choose a putter that you like there really isn’t any going wrong. Once you have a putter, the next step becomes learning how to use it well. A lot has been said about the way you approach the putting stroke but the truth is it is actually a pretty simple motion. The putting motion is often referred to as a “pendulum stroke,” because the idea is to bring the club straight back and straight through. As I referenced earlier, however, that simply is not the way that every stroke looks – some people do bring the head straight back and through while others allow the face to open and shut a little bit. While you definitely don’t want the clubhead to move too much you also aren’t going to need to think about it a whole lot. Just focus on keeping your wrists and arms in place as you draw the club back, and everything else will go relatively smoothly. The stroke itself is simple. In fact, if you ever watch professional golf you will likely notice that while every swing is completely unique, most putting strokes look very similar. A good stroke is important but it is also fairly simple. The more complex aspects of this part of the game happen before you ever step up to the ball. Let’s take a look at how you can read greens to get better results with your putter. When you step up to a putt what you really need to overcome is green itself which is designed to undulate in ways that make a simple thing like rolling the ball three feet into the hole very difficult. Putting greens have a variety of hills and slope that affect the path that your ball will be able to take to the hole. That being the case, the first thing that you should do when you get to your ball on the green is to take an inventory of your surroundings. Is the green sloping left to right or right to left? Is your path to the hole uphill or downhill? These are the factors that will determine where your ball ends up. Getting good at reading greens is mostly a matter of practice. Over time you will come to notice little tricks that make green reading simpler. For example, putts usually break away from lakes and bunkers. When a green slopes left to right, you are going to need to aim left of the hole in order to give your shot a chance. For the right to left putt, the opposite is true. Another thing that you will need to consider is speed. The downhill putt is going to take off pretty quickly, while the uphill putt is going to require a little bit more momentum to get to the hole. Quicker putts aren’t going to break as much as slow putts regardless of slope. Once you determine where to aim based on your speed and read assessment you will then need to pick a spot to aim for on the green. I always like to pick a spot as nearby as possible and hope that if I can manage to hit that spot the ball will continue to funnel to the hole. You can pick any spot that works for you. Often times, people find it easier to pick an area of grass that is slightly off-color, or otherwise easily identified but this is truly a matter of personal preference. Once you pick your spot all that is left is to hit your putt. Now that you have a firm understanding of the putting fundamentals, here are a few drills you can use to master them. The clock drill is commonly used to help players master the knee knocking three-foot putts. Really though, you can perform his drill from any distance that you find appropriate. To practice the clock drill you simply need to set up a series of balls around the hole each around three feet away. The goal is to make every single one of them without missing once. What does this drill accomplish? It helps you practice putts at all angles. This way you are getting to hit uphill putts, downhill putts, and breaks of every kind. This drill is particularly good for building confidence. Short putts are always just as much a mental challenge as they are a physical one. The more short putts you make on the practice green, the more comfortable you will be with them when you get to the course. The gate drill is pretty much what you might guess it is. To perform this practice technique, place two tees parallel from one another flanking your ball. They should be just wide enough to fit the clubhead of your putter. After that you will proceed to hit putts the same way that you always do, trying not to strike the tees on either side of the ball as you do. The idea here is to train yourself to keep the clubface square as it impacts the ball for more consistent results. 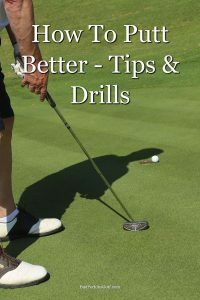 This is less a drill than it is a practice technique but it is also the sort of thing that guys like Tiger Woods and Phil Mickelson do to work on their putting so it is definitely worth considering. All you do here is set up from a distance of about two feet, and keep putting until you have made one hundred putts. I think that when guys like Tiger and Phil do this drill they don’t stop until they make one hundred in a row but for the rest of us just making one hundred at all is a much more realistic goal. The idea here is to build confidence and improve upon your ability to line up your putts which is one of the most important aspects of putting. Do it successfully one hundred times and you can certainly expect to start seeing better results on the course. You’ve probably heard the phrase, “Drive for show, putt for dough.” It’s a cliché but it is also true. Matches are won and lost on the putting green, so mastering this aspect of the game is sure to change the way you play. The more you practice your putting, the lower your scores will be the next time that you play. These putting tips and drills are sure to help you learn how to putt better.